Well, I suppose I am being a bit cheeky calling this "egg" fried rice as there is nothing eggy about it, I've not used the "vegg" or even black salt here - tofu fried rice would be more apt but I have completely based this recipe on the process of egg fried rice so we'll stick with that! 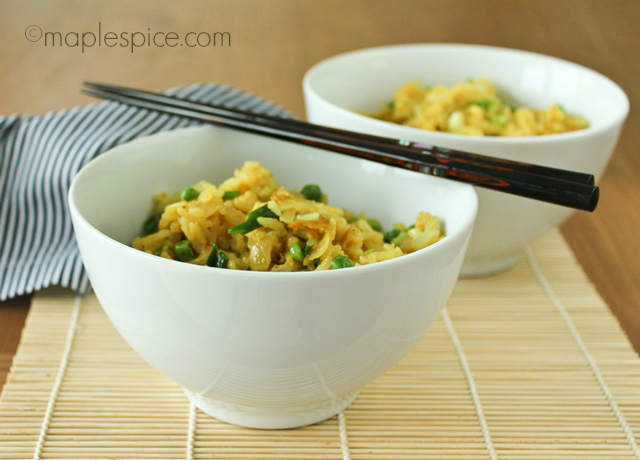 I'm quite particular about it too, and I'm clearly not the only one - the article I've based this recipe on contained a huge list of comments about what people think should or should not be in egg fried rice. For me, it's onions fried until sweet and golden brown, definitely peas, definitely NOT carrot, seasoned simply with soy sauce and a bit of black pepper and spring onion only thrown in at the end. That just leaves the main ingredient - egg. The type I used to make involved making a large flat omelette and dicing it up and adding it to the fried rice. 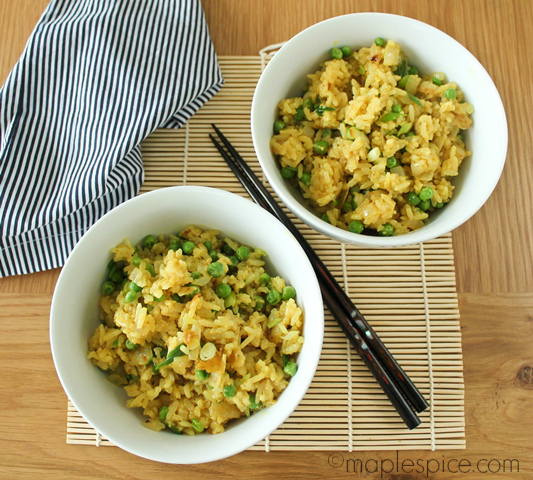 This would have been quite easy to veganize by simply making a thin tofu omelette and dicing it up the same way but I came across this Guardian article on the perfect egg fried rice and decided to try a different way. 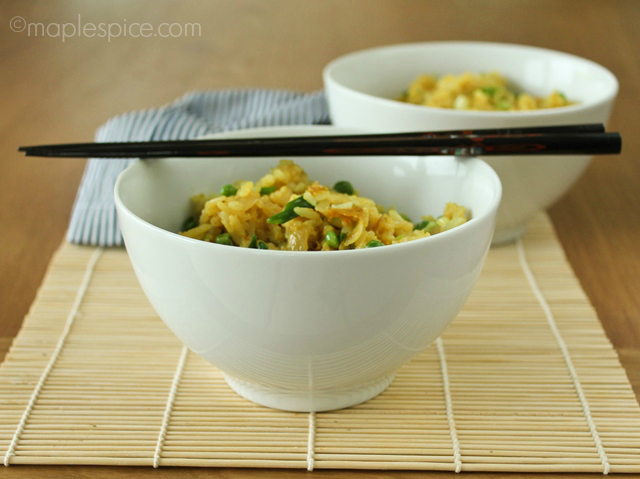 The article author tried several different methods of making egg fried rice but settled on Ken Hom's way of pouring over beaten egg and stirring it in vigorously until EACH grain of rice is absorbed with egg and you have a vibrantly yellow coloured rice with NO noticeable bits of egg in there at all. I loved this idea! Plus, I figured it would be a perfect method of cooking egg fried rice using silken tofu instead of eggs. *whispers* It's also a great way of secretly getting some tofu and thus protein into unsuspecting family members - ssshh! I first made up my "eggs" by blending firm silken tofu with turmeric, salt, pepper and as Mr. Hom adds it to his eggs - toasted sesame oil. This really adds to the end flavour of the dish and is a most welcome addition. I was too eager to try this rice right away and I didn't have any cold leftover rice to use so I just cooked up some basmati rice fresh. I then fried some onion until golden, added the rice, peas, soy sauce and some of the tofu egg mixture and fried it up. I ended up with what can only be called a congealed mass of rice porridge - sticky and mushy BUT my God it was absolutely delicious!! As Ken Hom insists you use cold leftover rice I cooked up some more rice, cooled it quickly and got it in the fridge to try again the next day. Second try I used the cold rice and only half of the amount of tofu egg mixture that I used the first time so it wouldn't be as 'stodgy' and the texture was perfect! It had intact individual grains of rice each coated in the yummy sesame/tofu egg mixture but this time the flavour wasn't as "wow" as the first dish. I realized this was because when I halved the amount of tofu mixture I also halved the amount of flavour going into the dish. 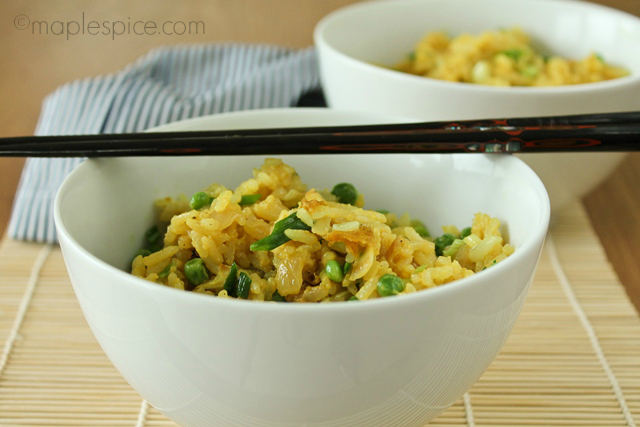 Note - you can also make this with brown basmati rice, it tastes great and best of all you don't have to use cold rice if you are using brown. 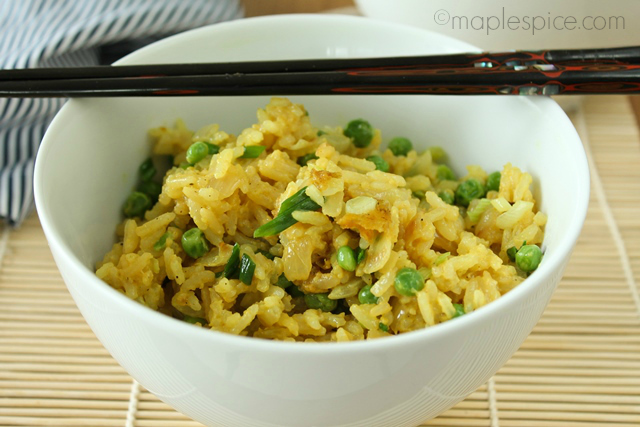 Just boil, drain and rinse and you can use it right away with no stickiness :-) Personally, I stick with white as it's how I prefer my "egg" fried rice but it's another option for you! • 150g (2/3 cups) dry weight white basmati or jasmine rice - you'll need 350g or 2¾ cups cooked rice. Tofu Egg Mixture - note: this makes enough for 4 servings of egg fried rice. First, make the tofu egg mixture by blending all the ingredients in a blender until smooth. You may have to shake the blender a couple of times and stop and scrape down the sides but it will get going. Please note that the mixture will taste too salty and strong at this point but don't fret - it all gets toned down in the final dish! Use right away or transfer to a bowl, cover and refrigerate until needed. If you have time to plan in advance, then wash the raw rice really well until the water runs clear, this is to remove all the excess starch. Bring a large pot of just lightly salted water to the boil and add the rice. Give it a stir, put the lid on, reduce to a simmer and simmer for 10 - 12 minutes until tender, giving it a stir a couple of times. Note - make sure you don't over salt the water, the rice will absorb too much and the end dish will be too salty - the egg mixture is seasoned enough. Drain in a fine sieve and rinse well with hot water. Shake off all excess water then spread out on a large plate to cool quickly. Stir the rice a couple times to help it cool down fast and once at room temperature tip the rice into a bowl, cover and pop it in the fridge. Make sure you get it into the fridge within an hour - health and safety and all that! If you need the egg fried rice today then you also wash the raw rice well, cook as above, drain and rinse with boiling water but then pop it back into the pot and heat, stirring gently on low heat just until all excess water is gone and the rice looks dryer. If you do it this way make sure your stir fry is ready for the rice once the rice is cooked. To make the fried rice: heat 1/2 Tbsp of the peanut oil in a large wok on high heat and add the onion. Fry until soft and golden brown. Add the other 1/2 Tbsp of oil and let it get hot, now add the rice and fry until the rice is well coated in oil and hot. Spread it out to make sure it all gets cooked, if it starts to stick, turn the heat down a bit. Add the peas, give it a stir then add the 1/2 cup of tofu mixture. Stir gently whilst frying until each grain of rice is coated and the mixture cooks down and looks drier, this takes maybe 5 minutes, you'll know when it's done as each grain of rice won't look so wet. Also, don't worry if the mixture sticks here and there, my wok ends up in a right state after this :-D Stir in the soy sauce and fry for another minute or so then turn off the heat and stir in the spring onion. 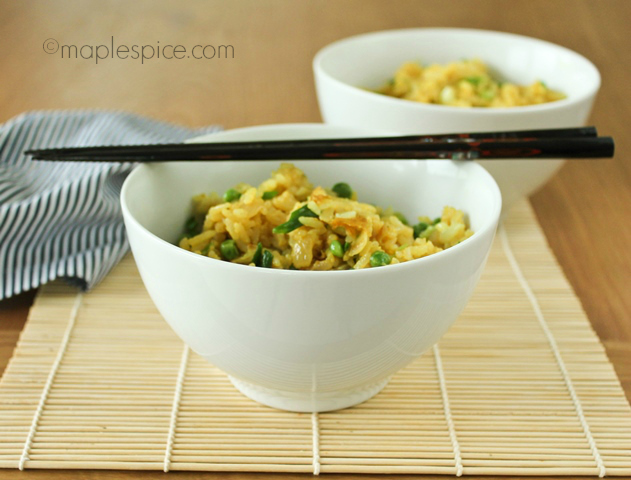 Split into 2 bowls and serve immediately! Hope you like it Natalie, thanks for the comment! I just finished preparing this recipe, the only subtle change was to use Black Salt (Kala Namak, found in Indian stores)It is absolutely delicious!! I appreciate your creativity and I will make this again and again. This looks fantastic. I've only been vegan for several months and sometimes I want more flavor than plain brown rice. I'm so glad to have found your blog - I studied abroad in Ireland in college and it was one of the greatest experiences of my life. I discovered your recipee just before supper... I happened to have somme rice already cooked... and kids who LOVE egg fried rice. But since we are (almost) vegan, eggs are not an option. We ALL LOOOOOVED this version! This looks great! Definitely saving this recipe!! So much better than what you can get at the restaurant for sure. That looks fantastic, Debbie! I love rice and peas. 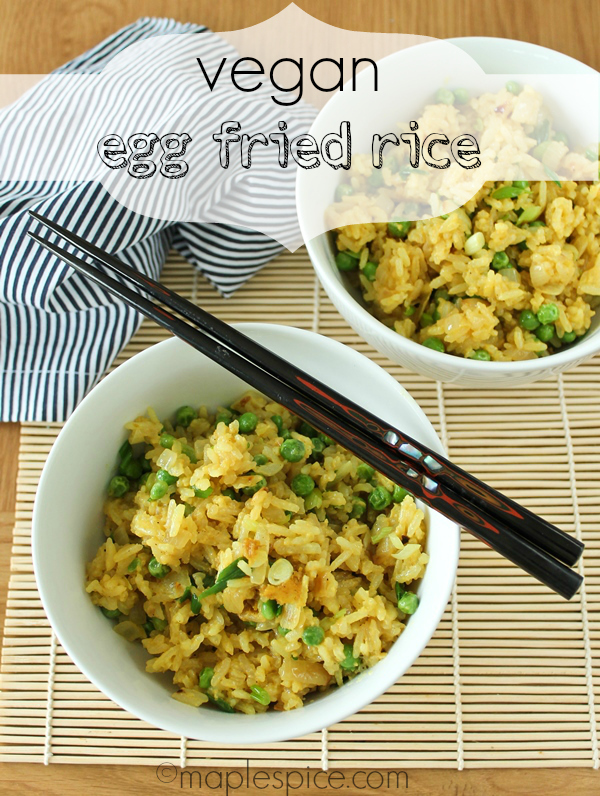 I never had egg fried rice, but I am surely trying this! I was just blog hopping a bit and hoping to ‘friend’ a few fellow vegans and fellow bloggers! I have to say your blog is great and your photos are awesome! Would it be ok if I linked you on my site and visited and commented often!? Thanks so much Jennifer :-) Of course it is! Thanks for stopping by! I agree with Natalie, this sounds like a great new go-to dish. I bet it would be great with some miso paste and edamame. Just found this blog, so glad I did! Always nice to see more vegan food blogs - come and stop by mine one day! (www.ladolcepita.com). Keep up the great work. This was delicious! My kids and I had it for dinner and I found my omnivore husband mowing down on leftovers in the kitchen later that night. I'm sure he didn't have a clue what was in it and I wasn't about to tell him. haha :-D That's brilliant, so glad you all liked it! For the "egg" tofu mixture, how long will that keep in the fridge? I don't need enough for 4 servings. Could you freeze? I thought I will never find this kind of recipe. Can you replace the sesame oil with other kind of oil for the 'egg' mixture? Hi! So sorry for the late posting of your question here, I've been having internet problems....You can replace the sesame oil with any oil really, I've only added it for the flavour as I love it, the egg mixture won't have the same flavour as mine but will still be good :-) Hope you like it!